Deals. They are everywhere these days. With our economy in a serious recession, consumers are laser-focused on getting the most for their money and EVERYONE loves a great deal. With the advent of location-based applications like Foursquare and Facebook Places, deals are becoming more relevant than ever before. The ability to geo-target a consumer walking into your store or down your block is a marketing first so it’s not surprising that many platform developers are jumping on the ‘location-based’ bandwagon. All the hype surrounding these new tools makes it difficult for business owners to make informed decisions about where to put their efforts. So let’s examine the facts and compare some of the more popular applications side by side. I chose to report on the most popular applications for location-based deal creation as well as those I have the most experience with. 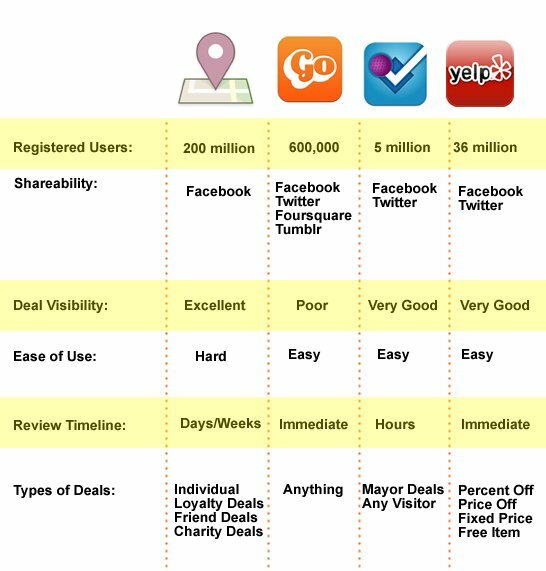 These include Facebook Places Deals, Foursquare, Gowalla and Yelp. I implore readers to comment with any information about additional platforms they feel have offered value to their business. One critical question that needs to be asked is “WHO is using these platforms?” followed with “Can my business offer them something they value?” I would also recommend setting goals for your location-based campaigns. For example, are you exclusively trying to recruit new customers via your deals? Or are you also targeting existing customers that may be ‘checking-in’ regularly? Claiming your business location on each platform may be eye-opening and can serve as market research. Studying past check-ins, tips and trends can help you ascertain which platform your audience might prefer and give valuable insight into what motivates them. According to a recent article published by fastcompany.com, location-based services are attracting ‘top clientele.’ They cite a recent study released by Forrester Research, reporting that those that ‘check-in’ via mobile devices are younger and more affluent than the average online user. The report claims that more than 70% hold a college degree or higher and have an annual income over $100K. That’s a whopping 30% more than the national average. This group of mobile users are also more likely to be influencers, reviewing businesses and making recommendations to their friends. While this demographic is marketing gold, reports state that only 4% of ‘online Americans’ use location based services. Some industry insiders feel that Facebook Places will be a game changer and these stats will increase dramatically in 2011. Rumor has it that Foursquare sign-ups increased dramatically after the debut of Facebook Places deals. So Facebook may be paving the way for mainstream adoption of all ‘check-in’ platforms, not just Facebook Places. Shareability: Does not easily share with other apps. Visibility: Check-ins and claimed Places Deals are displayed in News Feed. Deals are highlighted in yellow throughout the check-in screen. Ease of use: Difficult (Deals easy to set up if you can claim your page and Facebook approves the details after a review that can take several days or weeks). Demographics: General Facebook users skews slightly female (54%) and over 35+ (40%) according to istrategylabs.com data. Tracking: Measures how many deals have been claimed. Several weeks ago, I reported my disappointment with newly launched Facebook Places Deals. Since then, I have been on an emotional roller-coaster, falling in and out of love with Facebook deals. The benefits of running a Facebook deal should be obvious: largest target audience, organic visibility in the most popular social network and reassurance that the platform will be around for awhile. Unfortunately, there are some obstacles that make Facebook Places Deals less than optimal. Since launch, Facebook has made it increasingly difficult to ‘claim’ your places page. If you can FIND the places page in Facebook, you’ll then need to go through the claim process which may include a phone call and/or a message from Facebook letting you know your request is pending. They are now requiring that the profile used to claim the page include an email address with the domain of the business website. This becomes problematic when PERSONAL Facebook profiles utilize the required business email, as Facebook doesn’t allow more than one profile to be associated with each email address. After walking my client through the entire process, we were rewarded with an email stating that our request was ‘pending.’ We’re STILL waiting for an update regarding the status of her claim. Unfortunately – due to this delay – we have missed the ability to launch our Facebook deal prior to Christmas. And if you’re thinking “Why not contact customer support?,” you obviously haven’t dealt much with Facebook. Despite these difficulties, setting up your deal is fairly straight-forward once your places page is claimed. Facebook will review your deal – which typically takes a few days. Once approved, the deal is implemented and you’ll have access to deal stats from your Facebook Places page admin panel. Facebook tracks how many deals are claimed, quantity remaining and days left to redeem the offer. Facebook also makes it easy to share the deal in your page news feed. One thing I continue to love about Facebook deals are their visibility within Facebook. Each deal is highlighted with a yellow badge on the ‘check-in’ screen. The user can simply click on the location to get additional deal details. Once the deal has been claimed, the users news feed is automatically updated with the deal specifics. This built-in feature allowing for deal visibility within the users news-feed is singular to Facebook Places Deals. Other platforms allow you to easily share check-ins but NOT deals. With overwhelming reports stating the users are hungry for online deals, gaining visibility for a specific deal is valuable. Sharablitity: Twitter, Facebook, Foursquare and Tumblr. Visibility: Check-ins and earned badges can be shared on Facebook and Twitter. Ease of use: Easy (Once business is claimed, custom check-in message is updated immediately). Demographics: Relative to general Internet population, skews younger 25-34 and slightly female. Higher percentage of college and grad students (Alexa.com). Tracking: No tracking available for deal redemption. Gowalla has the smallest audience but I would bet Gowalla users are extremely loyal. The platform easily looks the best with it’s custom designed stamps and is the most ‘sharable.’ With the latest update, Gowalla users can now share info on Twitter, Facebook, Foursquare and Tumblr. Users looking to integrate location-based platforms may turn to Gowalla as a simple solution. Gowalla is working to entice businesses to create deals and has been working with national brands to reward platform users.They are currently running a ‘Gifts on the Go’ campaign, where users can win fantastic prizes. This ‘claim’ process is very similar to the other apps. They use a phone verification process with PIN Number to confirm all claims are legit. Once your place has been claimed, you can update a unique message to users, outlining any special offer you like. The drawback to this system is that there’s no badge or call-out to the special within the check-in interface. The user has to check-in to the venue in order to be notified a deal even exists. Currently, these special offers aren’t ‘shareable.’ However, special badges earned CAN be shared on both Facebook and Twitter. Perhaps sharing a deal will be included in a future update. More information on updating your listing can be found here: Business Details: http://gowalla.com/business. Sharability: Integrates with Facebook and Twitter. Visibility: Check-in displays in Facebook feed, but not specific deals. Tracking: Measures check-in stats but not how many deals have been claimed. Foursquare still leads the pack in stand-alone, location-based deal applications. They have made it easy for businesses to claim their locale and create a deal. Requiring only a phone call and PIN, a business owner can have a deal up and running within hours. Foursquare does review each deal but typically approves the deal within hours – not days or weeks. The deals receive GREAT visibility within the Foursquare platform. Users that check-in close to the business with the special offer will be presented with a ‘special’ tab that entices them to click to read more. This presents a great way for businesses to directly target their competitors’ customers at the point-of-sale. For example, if I ran a small bookstore close to Powell’s books, I could set-up a Foursquare deal that offered a special discount to every user that checks-in at Powell’s – thereby offering an extremely relevant promotion to someone who is looking to BUY books. Foursquare offers some interesting metrics to business owners. They outline the total number of check-ins, percentage of check-ins shared on Twitter and Facebook, top visitors and a history of all check-ins. They do not currently report on the actual number of deals claimed. Registered Users: 36 million with 1/3 of all searches happening via mobile. Sharability: Integrates with Twitter and Facebook. Visibility: Updates show in Facebook news-feed along with the photo and address of the business. Claimed deals do not show in the news feed. Demographics: Similar demographics as Gowalla and Foursquare with a higher percentage of female users. Yelp has long been in the local business game, offering tools to help local restaurants reach out to potential diners via special offers and announcements. They have now started offering check-in deals as well. The platform highlights the check-in offer when a user searches for nearby locations, along with any other location specials, announcements or events. The user can then claim or even store the deal by simply checking-in. 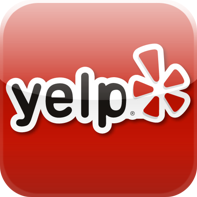 Yelp integrates with Facebook and Twitter, updating a user’s Facebook news-feed with a photo and address of the venue. Currently, claimed deals aren’t shared in other platforms. Creating a deal is very easy and only requires an email verification to ‘claim’ a business. Once the location listing is confirmed, check-in deals are created instantaneously with no review process. Once the deal has been created, Yelp also offers superb tracking. The platform measures check-ins, deals awarded and number of deals claimed. This is a great tool for ‘brick and mortars’ who feel they are getting no lift from ‘check-in’ campaigns. The numbers don’t lie. This article was originally published on socialfresh.com. « TMM thanks you for participating in our survey!